The ability to service and repair computers is a specialized skill that not many people possess. If you are fortunate enough to have expertise in this area, you may be wondering how to start a computer repair business with or without SDB certification. This post will cover some of the basic questions you will need to ask yourself, so that you can start a successful computer repair business no matter what type of experience or certification you have. The first step to be able to successfully start a computer repair business is to pick a specific area of computer repair that you would like to focus on. 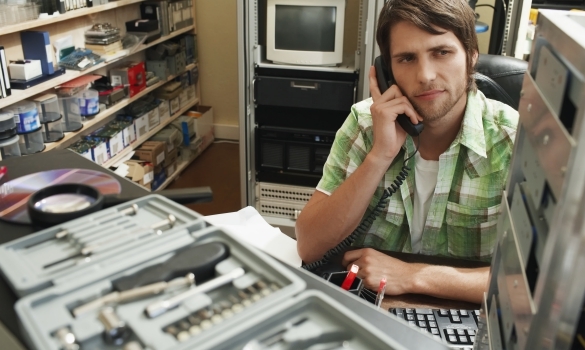 Will your business be inclusive of both hardware and software repairs? What operating systems or A3 printers will you provide service for? Decide which areas you are strongest in and focus on those. You may be tempted to offer repairs for all computers and operating systems, but that may be overwhelming for a new small business. Narrow down your selection to the areas you are strongest in and provide services for only those to start. Your first thought regarding whether computer repair certification is necessary is probably that no, it is not, depending on whether the Canadian government or US government will be overseeing your operations. However, you may want to reconsider this opinion. While you know that you are capable of repairing computers, potential customers do not. Obtaining a certification will allow you to gain their trust. Potential clients will see the certification as a guarantee that their tech is safe in your hands. Obtaining a certification may also place you at an advantage over your competitors without similar credentials. Computer repair certification courses can be costly, but they may be beneficial to future business. If you have the funds available, you may want to consider this option. Now that you have decided which areas you would like your business to provide repairs in, you must decide whether you will open a storefront or operate primarily out of your home. A brick and mortar building offers the advantage of marketing through visibility. People who live in the neighborhood will see your business often and may be more likely to remember you when they experience issues with their computers. However, storefronts also involve a larger financial investment. Buying an office is not cheap. If you are concerned more with cost than visibility in the beginning, it may be wise to offer in-home consultations for your customers. That way, you are cutting start-up costs and have the advantage of working on repairs at home. Just remember to advertise a bit more if you opt to start a home-based computer repair business. Hopefully, now you know which areas of technology your repair business will operate in and whether or not your business will have a storefront. Use this information to find similar businesses in your area to research market prices. This research will help you to get an idea of how to categorize the services you will provide and what the going rates are in the area. Keep these figures in mind when creating your own list of services like hosted voip so that your prices are competitive with others in the area. What work schedule will you set for your new computer repairs business? Obviously, you will not be working straight through until the problem is solved. This is not practical for all computer repairs. What will your business hours be? Customers need to know when they can reasonably expect to reach out to you and receive a prompt response. They should also have some idea of how long it will take you to complete your work. By setting work hours for yourself and business hours for your customers, you will be able to provide good customer service. You will also be able to better manage your own time. Make sure you do this before starting operations with your new business. How Will I Bring In Customers? If you want to start a computer repair business, you need to know how you will bring in customers. With all the competition in the technology industry, like Magento Enterprise, you will not be able to succeed without a marketing plan. Think about innovative ways you can bring customers to your business over the local competition. Then, once you have a solid customer base, make sure you provide top of the line services so that they return. If you want to open a computer repair business successfully, you need to know strategies to bring in customers, and then make use of customer retention strategies once you have them. Having answered these questions, you will be better prepared to successfully start a computer repair business. Then, you can start worrying about other business operations, like revenue management, once you start earning profits. Before opening your business, make sure you know what areas you would like to offer repairs in. Consider obtaining certifications if you have the extra capital, as it will provide your future customers with peace of mind and give you a competitive edge. Decide whether you will operate out of your home or a storefront. Then, be sure to research similar business in your area and set your pricing based on the findings from your research to remain competitive. Once you have answered these questions, you are well prepared to start a computer repair business. Be ready to work hard and your repair business will be sure to thrive.